A dry sink is a piece of furniture common in homes before the invention of indoor plumbing. Styles vary, but generally a dry sink consists of a cabinet with a slightly recessed top, made to hold a basin and pitcher for water. 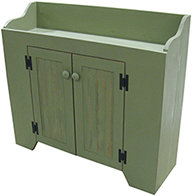 Often used in kitchens, bedrooms, or on porches, the lip around the top of the dry sink was made to contain any overflow of water along with the items being washed.Typically, this would include fruits and vegetables if the dry sink was in the kitchen or porch, and shaving supplies or other toiletries if it was in a bedroom. The cabinet was a convenient place to keep supplies out of sight. Towels, scrub brushes, and soap could all be tucked away, yet readily available. With the advent of indoor plumbing, the functionality of the dry sink was no longer necessary, but the look of a dry sink is still very popular in home decorating. Because it's not hooked up to any plumbing, the dry sink can be used anywhere as decoration, as well as provide a little extra storage space behind the doors of the cabinet area. All it takes is a basin and pitcher of water to restore its original purpose if you want to add a little authenticity to your country decorating! Sawdust City makes two sizes of dry sinks. Our 3 ft. dry sink includes two cabinet doors on the front, and our 2 ft. dry sink has a single door. Both sizes feature the raised lip around the top surface. We add a little curve to the edges on top for a bit of graceful country charm. 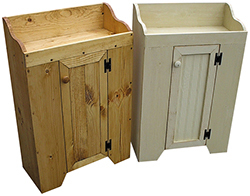 As with all our products, Sawdust City dry sinks are made from solid knotty pine, with sturdy construction using screws, not air nails. They are available in over 40 colors, 2 finishes, or natural stain and poly options. Our products are made with pride at our small shop in Eau Claire, Wisconsin. We make furniture that's meant to be used, it's not just for decoration! You can feel confident purchasing a Sawdust City dry sink, knowing it will last for years to come.